Darlington Football Club would like to announce that we have signed striker Mark Beck. Mark, 22, was born in Sunderland, and during the summer was freed by League Two side Yeovil Town after playing for them in season 2015-16. Mark, who stands six foot five inches tall, started his career at Carlisle United, and in three seasons made 66 appearances for them, scoring 7 goals. He had a loan spell at Falkirk in this time, scoring six goals, including one in the Scottish Premiership play off semi final. 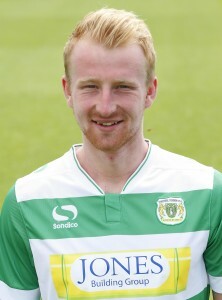 He was released by Carlisle in July 2015 and signed for Yeovil Town, making eight appearances, and he also had a loan spell at Wrexham, making eleven appearances. Even though he was born in the north east, his grandfather was born in Scotland, which made him eligible to play for Scotland Under 19s on three occasions.